WASHINGTON—Trade chiefs of the United States, Japan, and the European Union agreed to work together to tackle China’s unfair trade practices, a key reason behind President Donald Trump’s tariff war with Beijing. 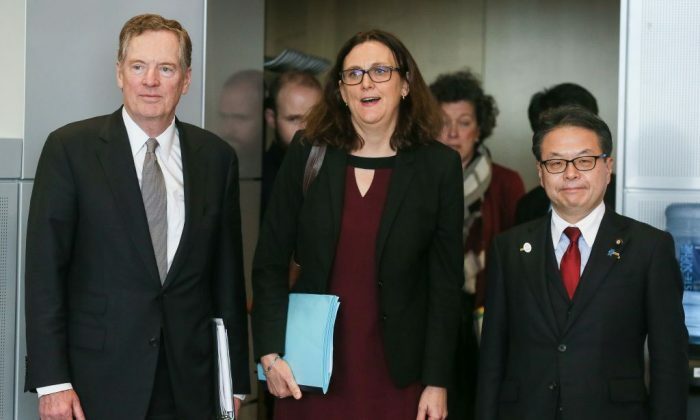 On Sept. 25, U.S. Trade Representative Robert Lighthizer and his counterparts Hiroshige Seko of Japan and Cecilia Malmstrom of the EU met in New York on the sidelines of the United Nations General Assembly. “The Ministers reiterated their concern with and confirmed their shared objective to address non-market-oriented policies and practices of third countries,” said the joint statement. The trilateral partners agreed to push for new rules and enforcement tools to tackle nations that undermine the global trade system. They also have expressed the need to reform World Trade Organization (WTO) rules that are not effective. The joint statement did not target China specifically, though the partners have expressed their concerns in the past about Beijing’s “economic aggression” and unfair trade policies that distort international trade setup. The trilateral meeting focused on setting new rules to combat industrial subsidies and state-owned enterprises, key tools that China has been using for decades. “The Ministers highlighted the importance of securing a level playing field given the challenges posed by third parties developing State Owned Enterprises into national champions and setting them loose in global markets—resulting in distortions that negatively affect farmers, industrial producers, and workers in the Ministers’ home countries,” said the statement. Chinese state-owned enterprises control strategic sectors like defense, energy, telecommunications, and aviation. The regime spends hundreds of billions of dollars to support these monopolies, according to experts. A recent report by the Office of the U.S. Trade Representative claims that China continues to protect its industries with excessive domestic subsidies, stockpiling of commodities, and discriminatory taxes. All these measures violate WTO rules, states the report. In the last decade, China has managed to create its own national champions in key industries, helping them expand their market share and overtake foreign rivals. To promote a more level playing field for their workers and businesses, the United States, EU, and Japan decided to set effective rules to address the market-distorting behavior of state enterprises. The officials condemned countries that force technology transfer from foreign companies to domestic companies, through various means including the use of joint venture requirements, limitations on foreign equity, and review and licensing processes. “The Ministers found such practices to be deplorable,” said the statement. The Chinese regime unveiled its 2025 blueprint three years ago, announcing the goal of achieving dominance by 2025 in 10 high-tech industries, including advanced information technology, robotics, and automated machine tools, and aircraft. To realize its economic ambitions, the regime has been resorting to various tactics including industrial espionage, cyber theft, and forced joint ventures in exchange for market access. This year, the Trump administration has taken a tougher stance on China’s decades-long protectionist and trade-distorting policies and started a tariff campaign against Chinese goods. In the trilateral meeting, the ministers stated their commitment to stopping harmful forced technology transfer practices and deepening discussions to address these problems. The ministers also agreed on the necessity of WTO reform. The Trump administration has been frustrated by the organization, calling its rules outdated. In 2000, President Bill Clinton permanently granted “most favored nation” status to China, which became a member of the organization a year later. China’s economic growth has accelerated dramatically since then. Chinese manufacturing output surpassed U.S. output beginning in 2009–2010, and the gap has widened further in later years, resulting in millions of lost U.S. manufacturing jobs.